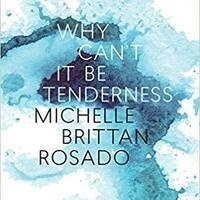 Join Michelle Brittan Rosado for the launch of her latest work, Why Can't It Be Tenderness. Michelle Brittan Rosado is the author of Why Can't It Be Tenderness, which won the Felix Pollak Prize in Poetry selected by Aimee Nezhukumatathil and is forthcoming from University of Wisconsin Press in November 2018. Her chapbook, Theory on Falling into a Reef, was the winner of the inaugural Rick Campbell Prize (Anhinga Press, 2016). Her poems have been published in Alaska Quarterly Review, Indiana Review, Poet Lore, and The New Yorker, as well as the anthologies Time You Let Me In: 25 Poets Under 25, Only Light Can Do That: 100 Post-Election Poems, Stories, & Essays, and Ink Knows No Borders: Poems of the Immigrant and Refugee Experience.